American History X volume III, Manifest Decimation, to be held at the Bermondsey Project Space, London, extends Ben Turnbull’s ongoing exploration of American political and social culture. 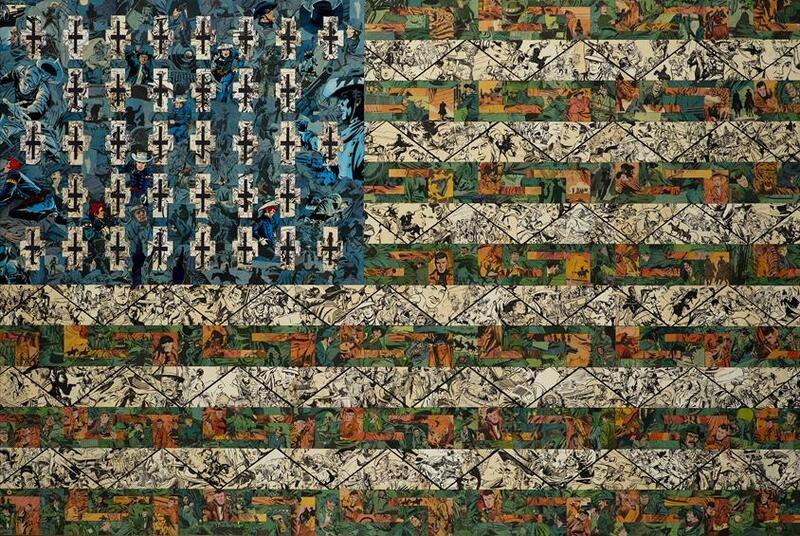 Comprised of seven large-scale collages executed in his trademark style – collaging vintage American comics – the works examine the history of the ‘Indian Removal Act’ and the concept of ‘Manifest Destiny’, a belief which led to a cultural genocide of native Americans. Manifest Decimation is a revisionist take on the mythology of how the west was won. Using cut-outs of Western comics and pulp novels – the type that showed ruthless colonisers as a necessary force for civilisation – Turnbull spins it around and makes the Indians the victors, the cowboys the vanquished. The centrepiece of the exhibition – his first since his highly-acclaimed solo show at Saatchi Gallery in 2017 – is a re-imagining of Mount Rushmore with Native Americans now centre stage, and, on closer inspection, the surrounding terrain is a vast battleground of comic book Cowboys and Indians. The exhibition is the third in an ongoing series, following American History X volume II, Smells Like Teen Spirit, and American History X volume I, The Death of America, 2013.